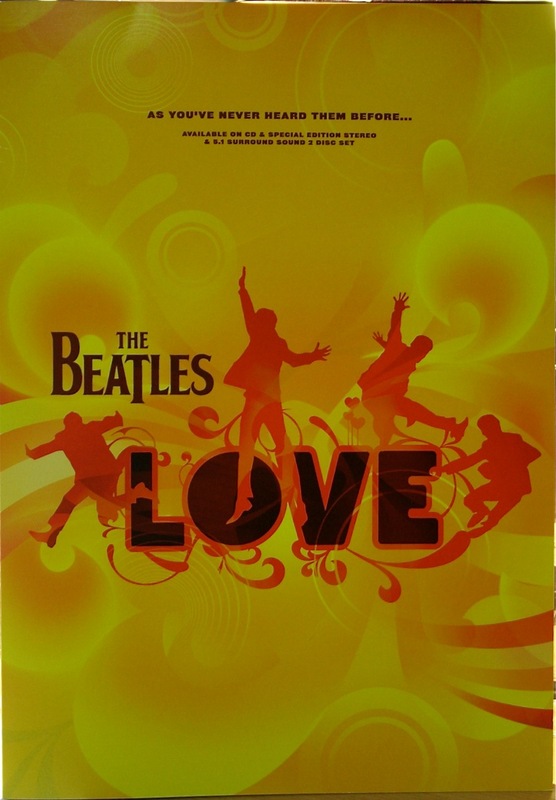 At the Beatles own official website there’s a lot of info about “Love” their 2006 album, which is not only the soundtrack to the Cirque du Soleil performance show celebrating the Beatles music, but also a controversial departure for the Beatles in that its made up of some of their best-known songs remastered and re-mixed with sounds and songs from across their extensive catalogue. 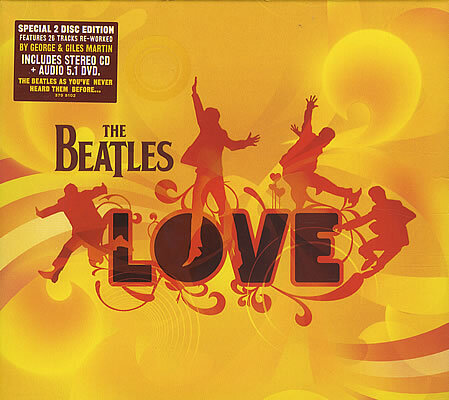 “Love” is produced by longtime Beatles producer Sir George Martin and his son Giles, and it won two Grammy Awards in the categories Best Compilation Soundtrack Album for Motion Picture, Television or other Visual Medium, and Best Surround Sound Album. Then there was a two-disc set that came with more elaborate packaging. It’s a double fold-out Digipac in a thick slipcase. 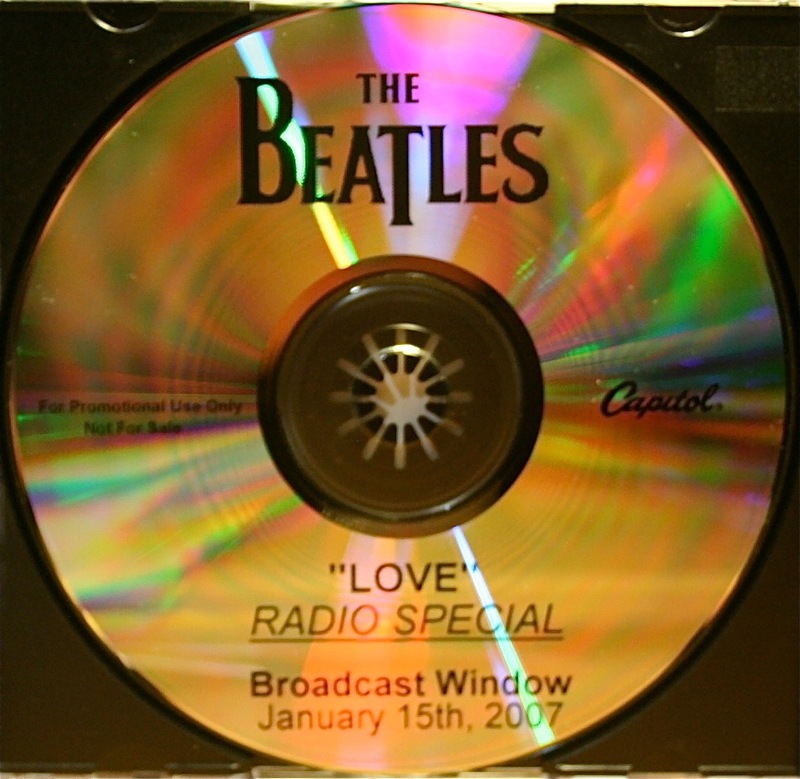 The package contains the single CD with the standard stereo mix (but with a slightly different printed image on the CD to the single version CD shown above). Added to this is a separate DVD disc containing the 5.1 surround sound mix. Same track list and songs – but if you have a 5.1 stereo set-up at home, the songs and sound effects surround you. It has the same booklet as the single CD release. 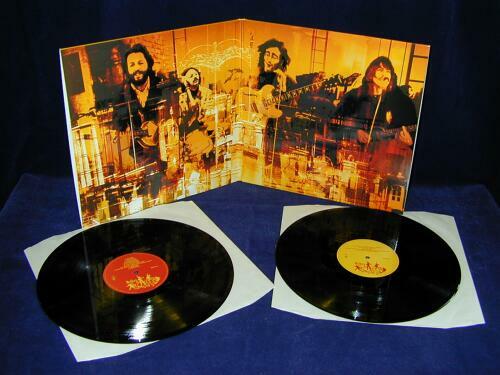 The final official commercial release (which came out a few weeks after the CD’s) was the vinyl LP. It arrived in a deluxe, 2 disc, gate-fold package. Mine is still sealed, so these images I’ve borrowed from the web. 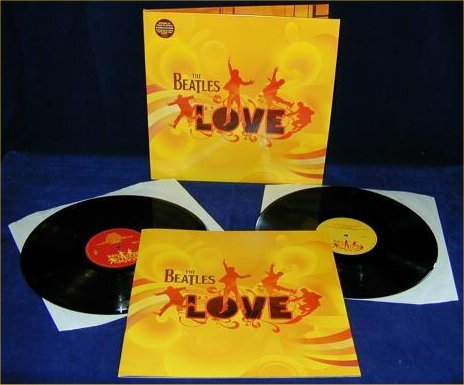 As you can see the vinyl edition came with custom labels for each LP, and is contained in a gate-fold cover with a large-format book. Its similar to the CD booklet, but because of the large format – complete with rich colour images from the Cirque du Soleil production – it is way more impressive. 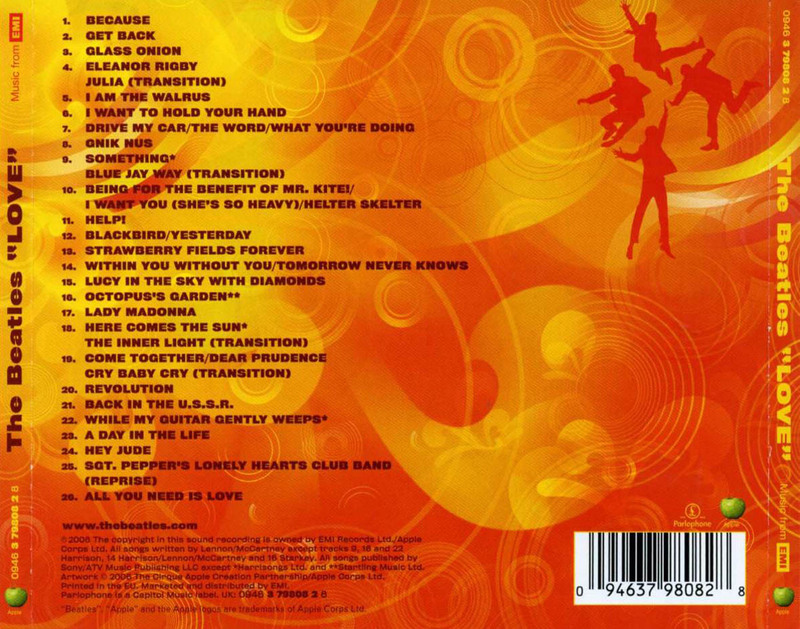 There are some images of this CD below. If anyone can shed any more detail on this release – drop me a comment and let me know…. 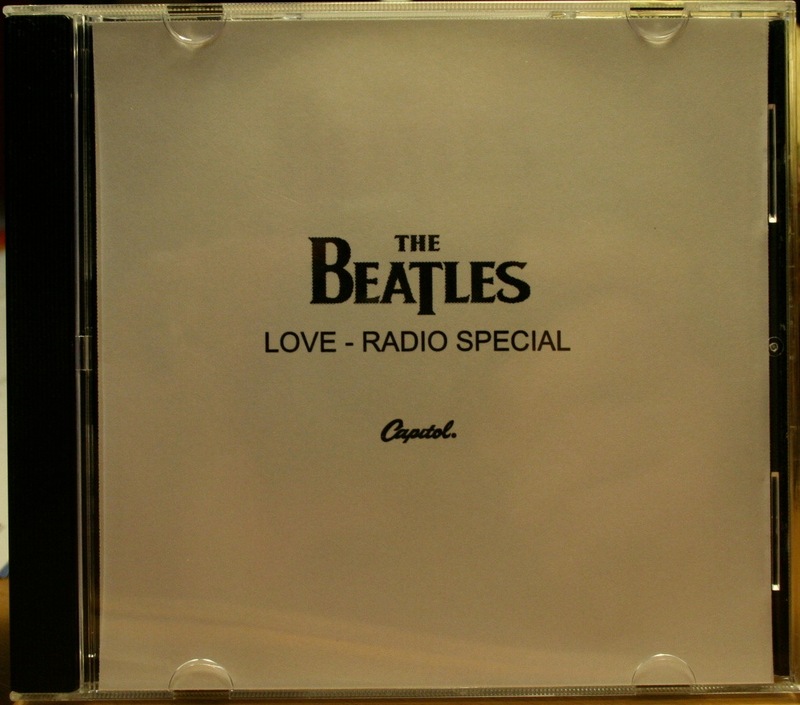 "Love" Capitol Records Radio Special - front cover - genuine? 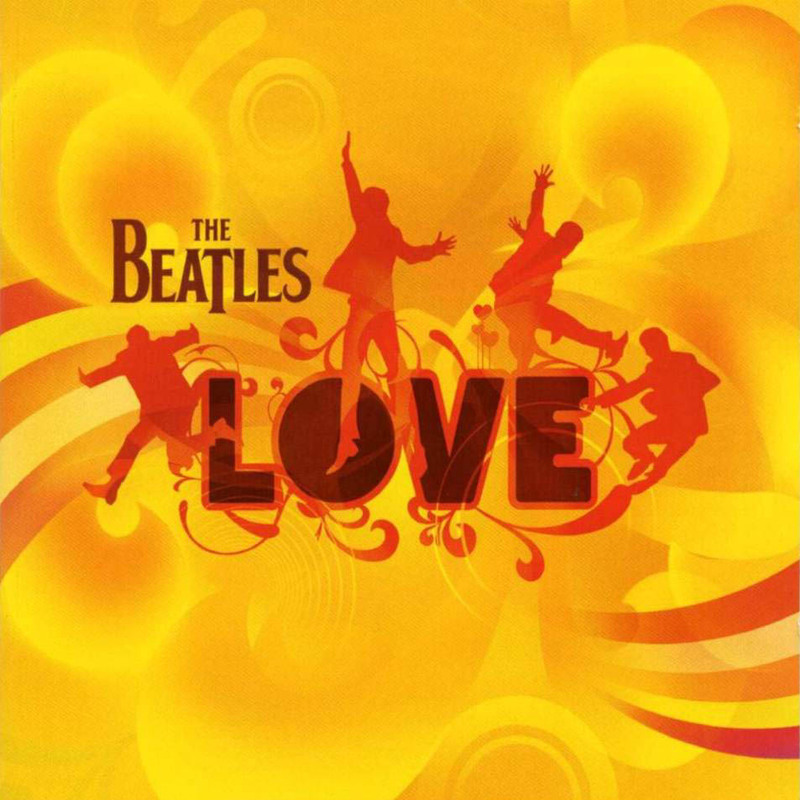 Meanwhile….at the time of the “Love” release the Beatles official website had not long been launched (it looked quite different to it’s present incarnation), and Apple used the new site to deliver a series of five down-loadable podcasts to further promote “Love”. 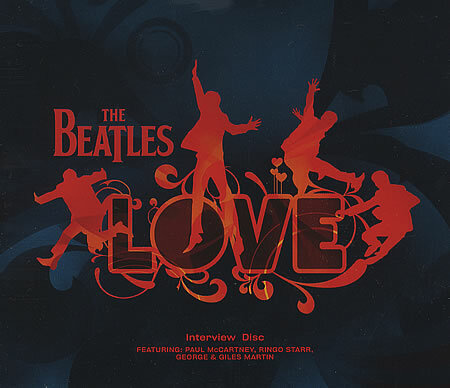 Each was between six to seven minutes in duration, and like the official “Interview Disc” above, it contained extracts 0f Paul, Ringo, George Martin and Giles Martin talking about “Love”. Hosted by UK presenter Robert Lindsay, it contains music extracts mixed with the spoken word extracts. Quite nice to have. 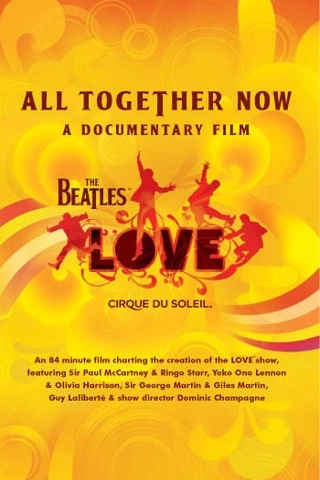 Yet another spin-off for collectors was the DVD “All Together Now”, a documentary film about the creation of the Cirque du Soleil show and the accompanying soundtrack CDs. Earlier this year took out a Grammy Award for Best Long Form Music Video. (I posted about this at the time). You can still see “Love” by Cirque du Soleil at The Mirage Casino in Las Vegas. MTV reviewer Gil Kaufman saw the show just last month (April, 2010) and had this to say. 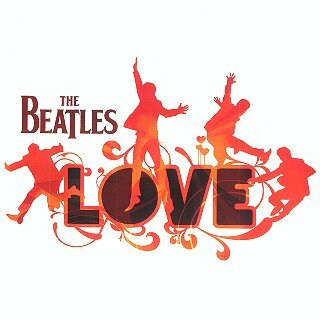 The Beatles own site has some fun facts about the “Love” show. 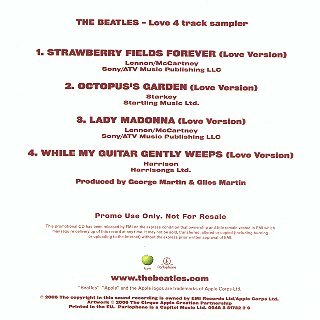 This entry was posted in Beatles, Beatles Collecting, Beatles Music, Beatles Related, George Harrison, John Lennon, Paul McCartney, Rare Beatles, Ringo Starr, Uncategorized and tagged All Together Now, Apple Records, Beatles, Beatles "Love", Beatles Collecting, Beatles Radio Special, Beatles Related, Beatles Remastered, Beatles Stereo, Cirque du Soleil, Rare Beatles by beatlesblogger. Bookmark the permalink. Just thought I’d add a little something about your LOVE releases. 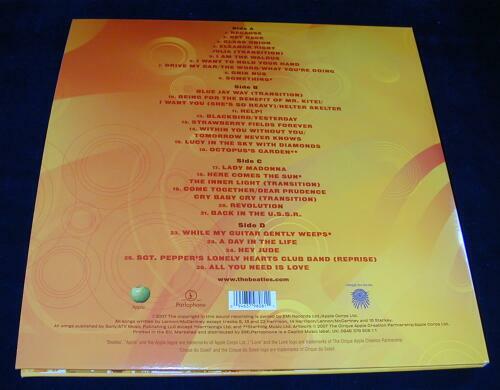 I have a Japanese promo CD single (familiar bright yellow cover and nice insert that lists the other tracks on the full CD release) that contains the track Within You and Without You/Tomorrow Never Knows. Apparently, so the tale goes, it was created for Japanese radio stations but issued by EMI Japan without the full knowledge of EMI’s London office. It was withdrawn shortly after release, thus making it rather uncommon. 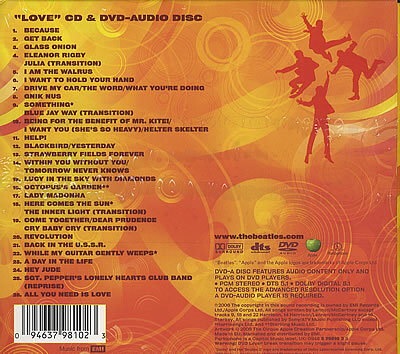 It is absolutely NOT an unauthorized release but remains the only CD single issued from the LOVE project. “Promo Sample” is printed in Japanese around the hub. Label number on disc is PCD-3275. Glad you enjoy the site. 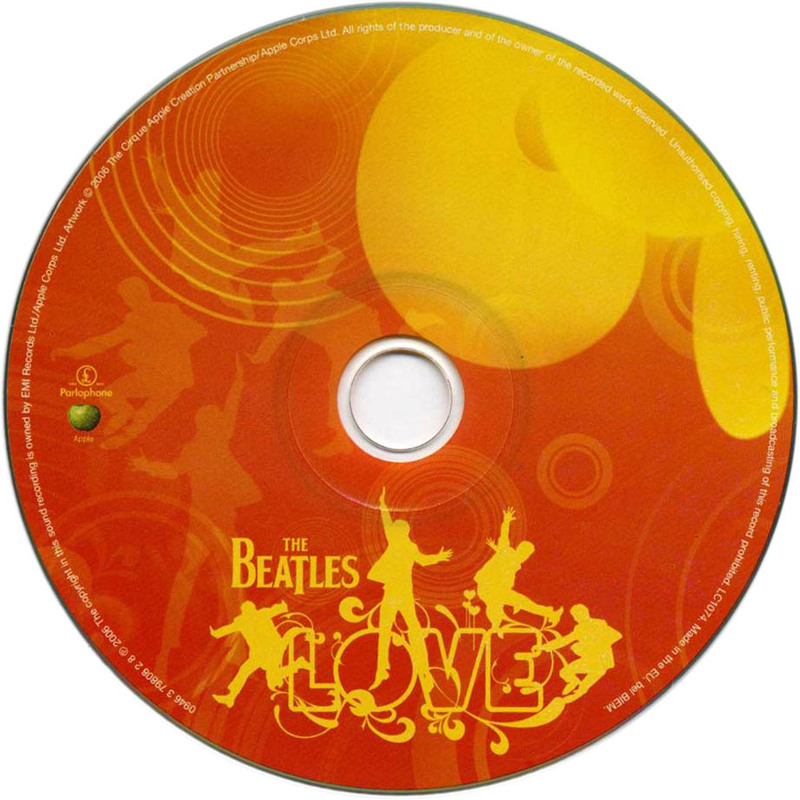 The Japanese promo CD single you have from the “Love” release sounds a really inteersting and collectable item – especially as it sems to have been accidently released by EMI Japan, then withdrawn! If you could send me an an image of the cover and the CD disc itself that would be great and I will post something about it. I guess it’s most strange knowing that Paul never, at least late in his career, aged as a “cool” guy. He always held his artistic credibility, but did many things that are quite cringe-worthy. That cool factor kind of dropped a bit. In recent times, though Paul’s cool temperature is red hot. He’s got several artistic and adventurous solo albums, and has also produced a remix album, and avant-garde album under a different moniker that would make the coolest hipster nod in approval. Maybe a Fireman tune or two will make a Coachella appearance as well, it’s nothing too much just out of sight.